The Poodle Club of America Foundation Inc. is a non-profit, charitable corporation dedicated to the health and future of Poodles. Thanks to the generosity of our founders and ongoing donors, we provide financial and other support for charitable, educational and research efforts for dogs in general and Poodles in particular. Take a look around the site for more on our work and (see Samples Needed) how you can help us give something back to this breed that gives us so much. Looking for a Poodle Puppy? Searching for an addition to your family? Good breeders are devoted to producing happy healthy puppies, of course, and this devotion includes routine health screening of potential parents. For health tests currently recommended by the Poodle Club of America, click here: Poodle Health Screening 2017. 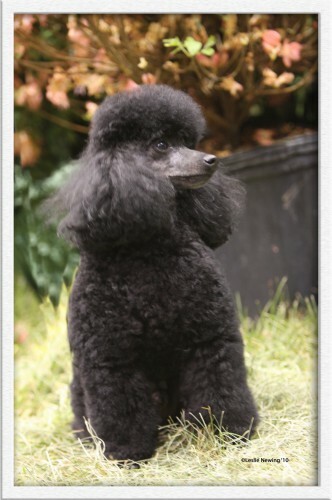 For help finding breeders of Toy, Miniature and Standard Poodles in your area, contact PCA’s breeder referral liaisons: https://www.poodleclubofamerica.org/all-about-poodles/find-a-poodle/breeder-referral/breeder-referral-contacts. Here Comes PCA 2019: We hope you can join us April 16 for our annual PCA Foundation Seminar offered at no cost to those who attend. This year we are pleased to welcome Pat Hastings presenting her renowned seminar “Structure in Action: Makings of a Durable Dog” with an emphasis on state-of-the breed in Poodles. Read more on our PCA schedule here: PCAF 2019 Seminar and Health Testing. May, 2018: Samples Needed for New Study on Back Problems in Poodles. 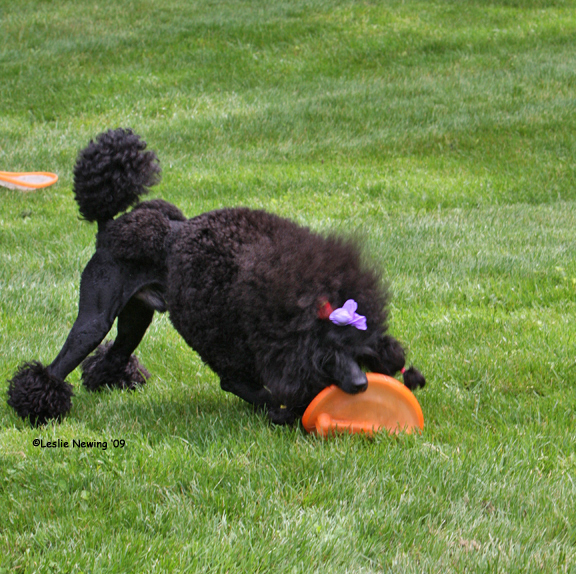 PCAF has awarded funding to UC-Davis for a new study investigating genetics involved in back problems of Poodles. Led by Dr. Danika Bannasch, a leading canine geneticist and featured speaker at our PCAF seminar in April, the study will focus on causes of intervertebral disc herniation, a painful condition often requiring expensive surgery. For more on this work and how you can help, click here: UC-Davis Study on Back Problems in Poodles. March, 2018: Several new studies need cheek-swab samples for research to benefit our breed, and of course participation is free and confidential. Please help if you can! Possible Genetics of Bloat in Standard Poodles: Researchers at UC Davis need samples from dogs that have bloated as well as from dogs who haven’t and have no close relatives who bloated. A recent Fred Hutchinson study found mutations in several genes that predispose Great Danes to bloat/torsion, but whether these findings apply to other breeds (or if different genes may be involved) remains to be seen. Contact Laura Bernier (bernierl@yahoo.com) for more information. Genes that May Increase Risk of Epilepsy in Poodles: Studies looking for a simple genetic explanation for epilepsy have come up empty. Now a University of Missouri team is using the latest technology to search for genes that may each ramp up nerve activity a bit too much until you reach a tipping point into seizures. A recent PCAF grant has extended their work to our breed, and samples are needed from Poodles of any variety with epilepsy. Please contact Liz Hansen at hansenl@missouri.edu. Genetic Diversity in Toy Poodles: The UC Davis researchers who developed genetic diversity profiles for Miniature and Standard Poodles are using remaining PCAF funds to extend this work to Toy Poodles. Barbara Hoopes at Colgate U is coordinating sample collection (bhoopes@colgate.edu). Here Comes PCA 2018 We hope you can join us for our free annual PCA Foundation Seminar Tuesday, April 17. This year we’re excited to welcome Dr. Danika Bannasch, a leading canine geneticist and excellent speaker, to talk about state-of-the-art in breeding healthy dogs. Read more here: PCAF 2018 Seminar and Health Testing. AKC CHF Health Conference Held in St. Louis: The bi-annual AKC CHF National Parent Club Canine Health Conference sponsored by Purina was held August 11-13, 2017 and gave attendees updates from leading researchers on topics ranging from cancer to epilepsy to emerging infectious diseases to canine reproduction and more. See abstracts of presentations here: CHF Conference Abstracts 2017. More Samples Needed for Study on Genetics of Inherited Cataracts, August, 2017: PCAF has just received a request from Dr. Aguirre’s team. They need more samples for their study of inherited cataracts in Toys and Minis, and they are also accepting samples from Standards. For more on inherited cataracts and how you can help, here is a summary with sample collection info from Dr. Leonardo Murgiano. Samples Needed for Cataract Research. Progress in Research on Inherited Eye Diseases: The Foundation has received a progress report from Dr. Aguirre’s team studying Optic Nerve Hypoplasia, Micropapilla and Cataracts in Miniature and Toy Poodles. The report not only discusses advances in this work but also updates info on the Day Blindness/Retinal Degeneration mutation the team discovered in Standard Poodles. A DNA test for the DB/RD mutation is now available from OptiGen and allows breeders to avoid producing affected puppies by never breeding two carriers to each other. Dr. Aguirre Progress Report 6-30-17. PCA Update, April 15, 2017: Dr. Steve Friedenberg will attend PCA April 24 and 25 to take samples from potential study participants and answer questions about his team’s University of Minnesota study on possible genetics involved in Addison’s disease. He will present a brief update at the PCA Foundation Seminar Tuesday, April 25 at 9:30 a.m. in the Purina Theater/Visitor Center. We’ll also have a brief update on genetic diversity testing, followed by Jane Killion’s acclaimed program Puppy Culture, helping breeders and owners do the right thing at the right time to ensure the best possible outcomes for puppies. Hope you can join us! PCA Clinics Update April 14, 2017: Don’t forget to take advantage of Dr. Seth Koch’s OFA/CERF eye exam clinic and the blood-draw clinic for OptiGen prcd-PRA testing (National Specialty discount) both from 9 a.m. to 4 p.m. Tuesday, April 25 in the Service Center near the main Purina Event Center. Wednesday’s blood-draw clinic had to be cancelled, but you can get OptiGen swab kits and prcd-PRA testing forms all week at the PCA Foundation table in the Event Center. You’ll also find kits for vWD, Neonatal Encephalopathy and Degenerative Myelopathy DNA testing at special prices. Look for the PCAF banner. 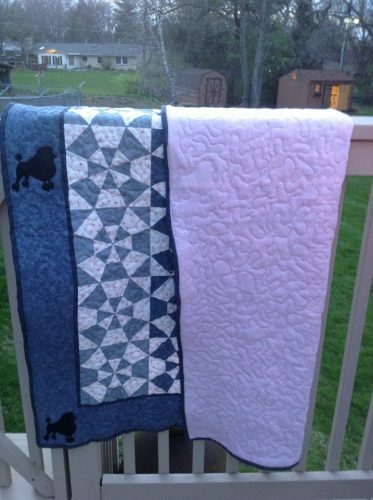 PCA Update, April 12, 2017: We have a surprise donation of a lovely quilt just completed by Joe and Barb Claude with poodle embroidery by their friend Pat Hogan. They would like the quilt auctioned as a fundraiser for the PCA Foundation in memory of their poodles Jaimee and Boomer. 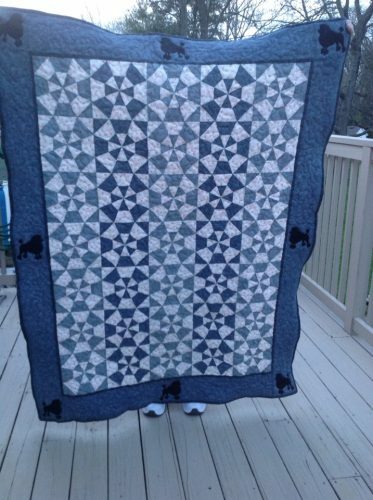 Tom Carneal already has a sealed bid of $600 and is happy to take additional bids (twcarneal@gmail.com) before the quilt is auctioned at Thursday’s PCA Blue Ribbon Dinner. Here are a couple photos. Many thanks to Joe and Barb! Feb. 2017: More Samples Needed for Addison’s Study Dr Steven Friedenberg, leader of the PCAF-funded research searching for genes involved in Addison’s disease, has asked us to let Poodle people know his team still needs samples from Standard Poodles with Addison’s. Shipping costs are covered by the study grant. Dr. Friedenberg is now at the University of Minnesota, and you can reach him by email at fried255@umn.edu. For more information, go to http://z.umn.edu/addisons. Looking Back at 2016: You can sum it up as Lots of Progress! For example, PCAF-funded researchers led by Dr. Aguirre recently announced that they have found the mutation causing day blindness/retinal degeneration in Standard Poodles, and a DNA test is now offered by OptiGen. This team is also closing in on genetics of optic nerve hypoplasia and forms of inherited cataracts in Minis and Toys. For a preview of our 2017 PCA catalog letter, click here: Another Exciting Year for the Foundation. Here Comes PCA 2017: PCA’s first National Specialty at Purina Farms is on the horizon, and PCAF is pleased to welcome seminar speaker Jane Killion, who will present her acclaimed program Puppy Culture on Tuesday, April 25. Hope you can join us! For more on seminar and health testing during PCA week: PCAF 2017 Seminar and Health Testing. What You Need to Know in 2016 About Vaccines and Vaccination: Missed Dr. Richard Ford’s terrific presentation at this year’s PCA Foundation Seminar in Salisbury? Click here for his handout on vaccines and guidelines: 2016 Canine Vaccines and Vaccination. 2015 Parent Club Health Conference: The AKC Canine Health Foundation held its biannual health conference in St. Louis, featuring specialists presenting updates on the latest research to improve lives of our dogs. For a summary of these fascinating presentations, click here for a PCA newsletter article: CHF Conference Newsletter 2015. 2015 PCAF Grants for New Research on Bloat and Genetics of PRA: PCAF has donated funding for two recently announced studies with potential to benefit Poodles. At the University of Florida, researchers are evaluating a minimally invasive catheter technique for continuous decompression of the stomach in a dog suffering bloat. Initial results are promising to prevent re-inflation of the stomach while the dog is transported to a hospital capable of bloat surgery, thus preventing further damage. In another new study, researchers at the Animal Health Trust are looking at genetics of forms of PRA (other than prcd-PRA) that can affect many breeds, including Poodles. This work is a collaborative effort among breed clubs and the AKC Canine Health Foundation and has the potential to identify mutations and develop DNA tests similar to the one for prcd-PRA that is now widely used by Toy and Miniature Poodle breeders. Diversity Project to Study Toy and Miniature Poodles: PCAF has awarded a 2015 grant of $25,000 to UC Davis for expansion of the diversity project (see below) to include Toy and Miniature Poodles. Many thanks to all who have made donations dedicated to this important work! New Project on Diversity in Standard Poodles: PCAF is very pleased to contribute funding for a new project investigating genetic diversity in Standard Poodles and how diversity relates to health, as well as creating an opportunity for breeders wanting to maximize diversity. Important potential benefits of this work include, for example, allowing breeders to compare genetic profiles of two possible mates and find out whether a low COI by pedigree really reflects relatedness of the two dogs. 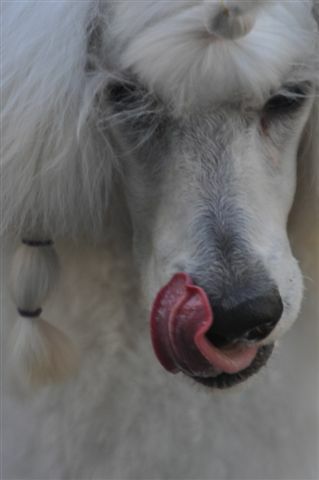 For more, go to www.vgl.ucdavis.edu/services/dog/GeneticDiversityInStandardPoodles.php. Project leader is Dr. Niels Pedersen at UC Davis, whose PCAF-funded research has been comparing diversity of Standard Poodles in the UK and United States and investigating the genetics of sebaceous adenitis and other autoimmune diseases. Dr. Pedersen and his colleagues also have analyzed genomes of Miniature Poodles as a potential “control” group for the SA research if they were identical to Standards except for size. You may be surprised (or not) that results showed Minis and Standards are genetically distinct! The SA and autoimmune disease research is now scrutinizing a group of genes implicated in autoimmunity in humans. You can scroll down here to find Dr. Pedersen’s reports on his team’s work, and please check our “Samples Needed” page to see how you can help if you have a Standard Poodle with an autoimmune disorder. New Donations for Poodle Health, August, 2014: PCAF has recently donated funding to the Rabies Challenge Fund and CHF Canine Athlete Initiative. The Rabies Challenge Fund aims to establish a scientific foundation for extending legally required rabies booster intervals to 5 or 7 years for dogs. Further, for the first time, the study’s rabies titer data should allow laws to incorporate clauses on rabies titers. Well known to Poodle people are co-trustee Dr. Jean Dodds and principal investigator Dr. Ron Schultz, who spoke on vaccination at the 2010 PCAF Seminar in Salisbury. Our other new donation supports the AKC Canine Health Foundation’s new research in regenerative medicine. The CHF Canine Athlete Initiative has launched a landmark study to evaluate platelet-rich plasma (PRP) and stem cells as treatment for the most common sporting injury in dogs, supraspinatus tendinopathy (similar to rotator cuff injury in humans). These injuries commonly progress to chronic pain and lameness. At the CHF National Parent Club Health Conference in St. Louis last summer, the study’s co-investigator Dr. Sherman Canapp gave a presentation that included video of exciting early results with this approach. New Fundraiser Supports PCAF: Many thanks to Charlotte Mitchell for organizing a new PCAF fundraiser, the Run Jump Challenge Fund, offering an opportunity to support the Foundation while celebrating achievements in performance events. For more, click here: Run Jump Challenge Fund. Savant Harris a Hit at 2014 PCA Foundation Seminar: Myra Savant Harris, RN, reports that she very much enjoyed her seminar in Salisbury, and we had lots of positive feedback from the audience, with comments such as “sensational” and “priceless.” If you missed this session, check Myra’s site (www.myrasavantharris.com) for info on her upcoming seminars at other locations. You can also find her wit, expertise and wisdom on canine reproduction, whelping and puppy intensive care in her books, available at her site and from online book sellers. New Research in 2014 on Genetics of Eye Disorders in Toy and Miniature Poodles: The Foundation is excited to fund new research to identify gene defects involved in three inherited eye conditions in Poodles: Optic Nerve Hypoplasia, Micropapillae, and Hereditary Cataracts. This project is a partnership between OptiGen and the University of Pennsylvania and is led by Dr. Gustavo Aguirre. Of course, Dr. Aguirre is well known in the Poodle world for PCAF-supported research that identified the gene mutation causing prcd-PRA and led to a DNA test that allowed Poodle breeders to end the toll of prcd-PRA blindness on our breed. Of course, like all research to benefit Poodles, this study needs samples to succeed. Go to www.optigen.com and click on the Research button to see how you can help. Many thanks to all who already submitted samples! PCAF has awarded a 2014 grant to North Carolina State University researchers searching for genes possibly linked to Addison’s disease in Standard Poodles. The team needs samples from dogs with Addison’s and dogs over age 10 who do not have Addison’s. They are especially interested in samples from “trios,” a dog that has Addison’s disease and both of its parents. For more information, check http://z.umn.edu/addisons. Calling All Mini Dwarfism Kits from PCA Week: At PCA 2013, to support breeders and help researchers complete their study of Miniature Poodle Dwarfism, the Foundation sponsored and distributed free DNA test kits for the mutation causing this stunting and crippling disorder. In a tremendous response from Poodle people, we gave out 400 kits! If you have any of the kits, please swab those mouths. You can help the researchers finish their work so they can report their results back to you. PCA Foundation Supports New Research on Bloat, Hemangiosarcoma and Leukemia: In addition to ongoing studies, PCAF is now supporting three new AKC Canine Health Foundation research projects. CHF has recently announced a major new initiative calling for research proposals aimed at putting an end to the horror of bloat and torsion. In the battle against canine cancer, Dr. Jaime Modiano is leading a University of Minnesota team exploring ways to disrupt differentiation of cancer stem cells and prevent the spread of hemangiosarcoma. At North Carolina State University, Dr. Matthew Breen and his colleagues are investigating canine leukemia, to better diagnose and treat the disease and potentially identify genes to target with new therapies. DNA Test Available for Miniature Poodle Dwarfism, December, 2012: Dr. Mark Neff and his colleagues at the Van Andel Research Institute have reported (online journal PLOS ONE, 12/26/12) that they have discovered the mutated gene that causes Miniature Poodle Dwarfism (osteochondrodysplasia) and developed a DNA test that allows breeders to avoid producing puppies with this deforming and crippling disorder. This project didn’t need PCAF funding, but dedicated Miniature Poodle breeders played a key role by ensuring that the researchers had enough samples to succeed. For labs currently offering the DNA test for osteochondrodysplasia, check OFA’s site, www.offa.org/dna_alltest.html. PCA Foundation Poodle Health Survey Results, August, 2012: We are pleased to be able to share with you all the data collected from the health survey PCAF conducted online and by mail for about a year and a half. The information collected is to serve as a guide in helping us better focus our efforts and limited funds where the need appears greatest. 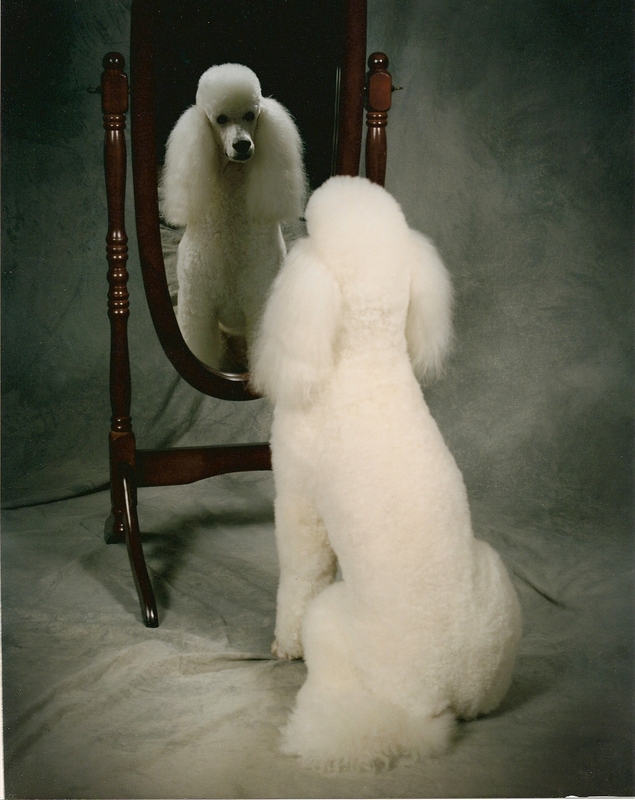 Click to read results for Survey All Poodles, as well as Survey Toy Poodles, Survey Miniature Poodles, and Survey Standard Poodles broken out separately. We had hoped to get information on 1,000 Poodles but we are very pleased with the data produced from the 848 Poodles we have. By Variety there are 615 Standards, 142 Miniatures and 78 Toys (13 didn’t designate Variety). PCAF wants to send a big “Thank You!” to everyone who took the time to participate. Genetic Comparison of Minis and Standards, June, 2012: For a surprise (or not! ), check out fascinating new research findings that Miniature and Standard Poodles are genetically distinct. See study results here: Genetic Comparison of Minis and Standards. Sebaceous Adenitis Update, May, 2012: Study leader Dr. Niels Pedersen has asked the Foundation to share his report on progress in the PCAF-funded Sebaceous Adenitis research. To read about initial results, click here: SA Research Update. Read about the 2011 PCA Foundation Seminar: Christopher Pachel, DVM, DACVB, a board certified veterinary behaviorist, had some surprises for his audience as he brought us up to date on factors shaping puppy temperament and the art of socializing our puppies, including the art of helping new owners build on their puppy’s good start. For more on his talk, click here: Dr. Pachel Talk. Vaccine Video for Affiliate Clubs: Dr. Ronald Schultz graciously allowed PCAF to videotape his 2010 PCA Foundation Seminar,“What Everyone Needs to Know About Vaccines and Vaccination Programs.” To share this important (and clearly explained!) information, PCAF sent a free video to all PCA Affiliate Clubs for circulation among their members. The Poodle Club of America Foundation has for sale VWD kits at $75, NE kits at $55, the Standard Poodle Database at $55 and a combined Miniature/Toy Database at $55. All prices include shipping. Please contact Doris Grant at dorianregdca@aol.com or at 941-921-0539 Jan-April, then at 613-215-0313. These kits and databases are also available at the PCA National in April. For a wealth of information about Poodles–the breed, the three varieties, finding a Poodle, Poodle health, Poodle clubs and events, Poodle rescue, PCA’s newsletter, etc.–go to www.poodleclubofamerica.org. To connect with PCA on Facebook, click the Facebook link in the sidebar at right.